As often happens, I stumbled on these London scenes while looking for something else. 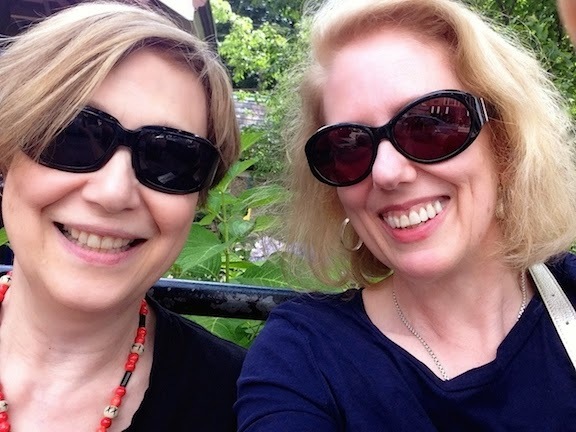 As also often happens, I found myself lured into sleuthing. The artist is Utagawa Yoshitora, popular in his time but a bit of a mystery today. We don’t know when he was born or when he died, but he was working from about 1850-80. About this time, Japan was opening up to the West. Most Japanese had never seen foreigners before, and images of foreigners and foreign parts were in high demand. 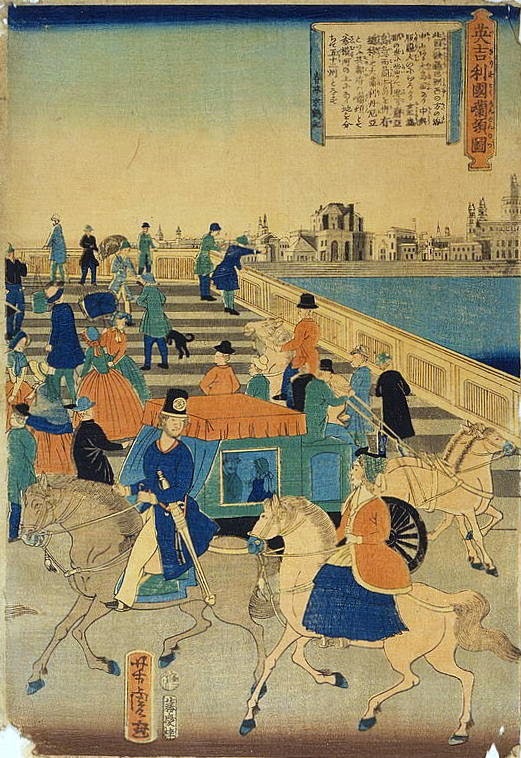 Prints like these, known as “Yokohama” prints, were made by artists who, like everybody else, had never seen any of the people or places they portrayed. It’s believed that Yoshitora, who’d lived near Tokyo, might have seen some foreigners, which made his people’s clothing a bit more realistic than those of other artists. However, like the others, he depended on illustrations from foreign publications in creating his scenes. We know he was a well regarded artist—and that he got into trouble with the strict Japanese censors for a satirical print (note that English satirists got into trouble, too)—and was sentenced to 50 days in handcuffs (I am not sure what this means—jail, house arrest???). 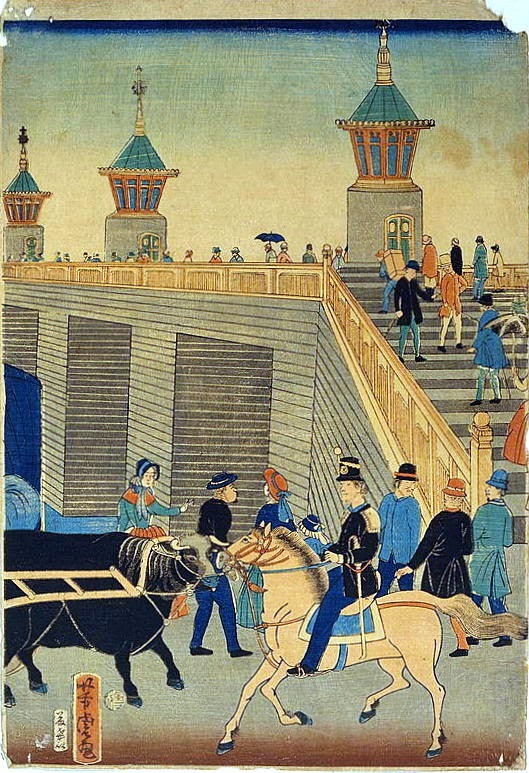 The Yokahama prints eventually went out of fashion, and Yoshitora himself vanishes after 1880. These three prints form a triptych, which I’m unable to assemble for you, given the blog’s limitations. But I think each is charming enough on its own. I’m not sure about the 1866 date the Library of Congress entry provides, since the British Museum site tells us the demand for these pictures peaked in 1861. You can read in more detail about Yoshitora at my sources, here, here, and here. 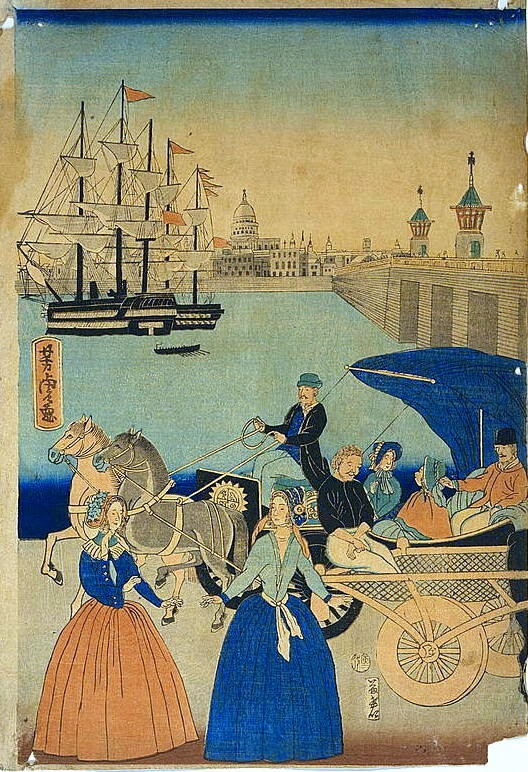 Images: Utagawa Yoshitora, Triptych, Picture of London, England, courtesy Library of Congress Prints and Photographs Division Washington, D.C. 20540 USA. How interesting! I love the color choices -- all shades of orange and blue. I wonder if it was intentional, or a limitation of the pigments available, or if that's just the way the pigments aged/faded. Once again, a wonderful post, ladies.